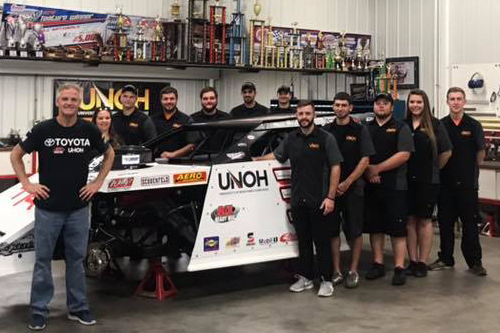 Nearly a dozen members of the UNOH Motorsports team traveled to Pevely, Missouri for the 23rd Annual DirtCar Fall Nationals. The event has long been hosted at Eldora Speedway in Rossburg, Ohio and was relocated to I-55 Speedway this year. I-55 Speedway is a high-banked 1/3 mile dirt oval. The track is owned by Ken Schrader, a former NASCAR driver and now dirt track racer. Before the team kicked off the weekend of racing, they made a pit stop at Kenny Wallace’s race shop in Arnold, Missouri. While at Kenny’s shop, team members were able to tour his shop and see how he runs his race team. Wallace is a long-time supporter of UNOH and loved having the chance to welcome the University motorsports team into his shop. Team members were able to talk to Kenny about how he started out in his career and got to where he is today. We caught up with team member and driver Will Norris and spoke with him about visiting Wallace’s shop, “The experience was great for us as students, his shop was awesome to see in person and having him give a tour of it was awesome! The amount of memorabilia in that place was a true sight to see, and each piece was significant to him. He literally walked around looking at trophies and would tell us an interesting story about his favorites. As a racer, we constantly just seem to chase trophies, but for him he was living in the moment and it led to many memorable moments! I’m happy I got to go and always happy to represent UNOH” Norris shared. Following the stop with Kenny, it was now time to get racing. The team had a slow start to Fall Nationals, as the practice day on Thursday got rained out. Friday was a full day of racing as drivers and their teams ran hot laps, qualifying and qualifier heat races. 35 teams would be making the call to try their hand at wining the 23rd DirtCar Fall Nationals. Brenden Rassel piloted the #1 UMP Modified and Will Norris was behind the wheel of the #71. Brenden and Will had their hands full, competing with some of the best in the business. Brenden, first on the track, ended up with a best qualifying time of 15.312. Will was in qualifying group #2, where his best time was 15.898. Next up were qualifier heat races where both guys started 8th. Brenden was in heat 1 and Will in heat 5. Both drivers were still trying to figure out the track, as this was only the second time driving on the track for both of them after the rainout on Thursday. Norris and Rassel both finished where they started and it put both of them in the B-Mains for the final night of DirtCar Fall Nationals on Saturday. Will and Brenden both learned a lot and came back to their crews with plans for the next night so we could make it into the main event. Unfortunately, those plans never got to be put into play as the final night was interrupted by heavy rain. The team joked that Mother Nature just must not like racing. The races were postponed until March 29, 2019. This trip concludes the 2018 season for the UNOH Motorsports team. They now go into their off season, where they will start preparing for the 2019 DirtCar Nationals in Volusia, Florida and start recruiting team members for the 2019 Team.